Explore our newest gallery installations, including Question Bridge: Black Males and Black Power, along with Mildred Howard’s TAP: Investigation of Memory. In this free event, teachers and chaperones will learn strategies to confront difficult history and celebrate diverse racial and cultural identities year-round. No RSVP required to attend. 4:30–7 pm: Enjoy Docent-led snack-sized tours, complimentary tickets to Off the Grid food trucks and bars for the first 100 arrivals, a raffle to win prizes, free Museum admission including access to The World of Charles and Ray Eames, and a one-night-only 10% discount on your OMCA Store purchases. Learn about our Black History Month performances and other program and tour offerings at OMCA. No need to RSVP for these drop-in activities. 5 pm: Take part in an exclusive tour of our new Gallery of California History installation Black Power with OMCA staff. 6 pm: Come learn strategies and tactics for supporting students’ cultural, ethnic, and racial expression in the classroom. Hear from a range of educator perspectives, including Rachel Reinhard (UC Berkeley History-Social Science Project), Joya Brandon (San Leandro High School), and Sonja Travick (Oakland Tech). Ask questions, and engage with your fellow educators, colleagues and OMCA friends during this informal panel discussion. 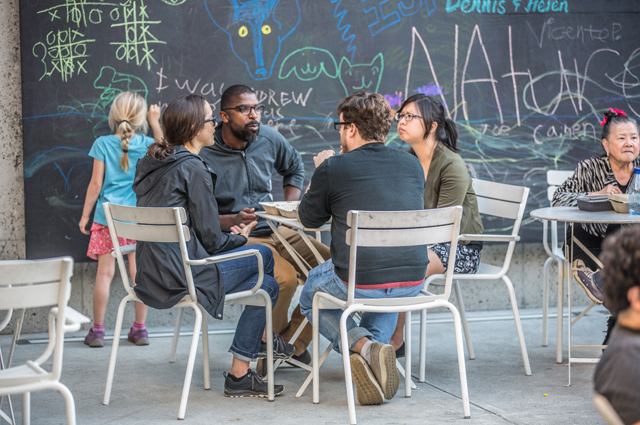 During Friday Nights at OMCA, from 5 to 9 pm, enjoy food trucks from Off the Grid, late-night gallery access, live music, family-friendly art activities, and more.